As we started down the Mississippi, we were surprised to see long stretches of sandy beach. This is evidently not what you would usually see. The river is extremely low, and we had vacillated back and forth about whether to try this route or not. It has been so low this summer that the size of the barge arrays had been restricted at times to keep them small enough to be able to pass each other on the narrowed channels. Things had gotten somewhat better, so we decided to take a shot. The Mississippi River begins at Lake Itasca in Minnesota as a small stream. As it flows south, it becomes one of the largest watersheds in the world - the drain for nearly half of the country. The Lower Mississippi River begins at Cairo, KY and flows nearly 1000 miles to the Gulf of Mexico. This portion of the river is mostly used for commerce. There is very little recreational boating; which also means there are few facilities for recreational boaters. There are also no locks. The river runs freely and is guarded by levees and flood walls and wetlands. With no docks available, our first three nights on the river were spent at anchor. I looked back in our log and found that the last time we'd anchored was June 17 - had to learn the routine all over again! We anchored in slack harbors. These are small off shoots from the river where there is little or no current. It doesn't mean they are unused, however. 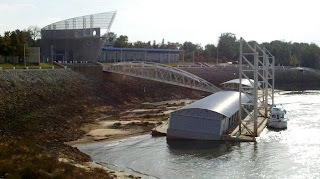 They often contain barge loading/unloading facilities. At Osceola Landing we came in past several barges, passed by where they seemed to be loading grain into some, and anchored near a work barge at the end of the harbor. When we left in the morning, we found that they'd been busy all night and had nearly filled the small channel with empty barges. It was a tight squeeze getting back to the river. Our first big stop was Memphis. We docked at Mud Island Marina, only going part way into our slip because the water was too shallow to make it all the way in. Our friend, Mike, a Memphis resident, came to visit and later dropped us at Gus's Fried Chicken - apparently world famous and very good. But only go there if you want fried chicken because it (with a few sides) is the only thing on the menu. After that we did a quick tour of the Gibson guitar factory, walked by Beale Street and finished in time to get to the Peabody Hotel by five o'clock. The Peabody Hotel, of course, is home to five famous ducks. The ducks swim in the lobby fountain all day and then, with great ceremony, leave the fountain at 5pm, walk down the red carpet to the elevator, and ride to their penthouse pens for the night. The crowd to watch was surprisingly large - it was a Wednesday - but it was fun to see. The hotel itself is magnificent, too. They also claim to have the only French restaurant in the world that does not serve duck, for obvious reasons. After watching the ducks, we started walking back to the boat. There's a nice pedestrian bridge and monorail leading to Mud Island Park - unfortunately it closes at 5pm. What?? There really isn't another way to get there by foot, so we had to take a cab. Then our plans started changing. Predictions were that the river would start dropping - although it was also going to start raining - which would leave us aground in the marina. 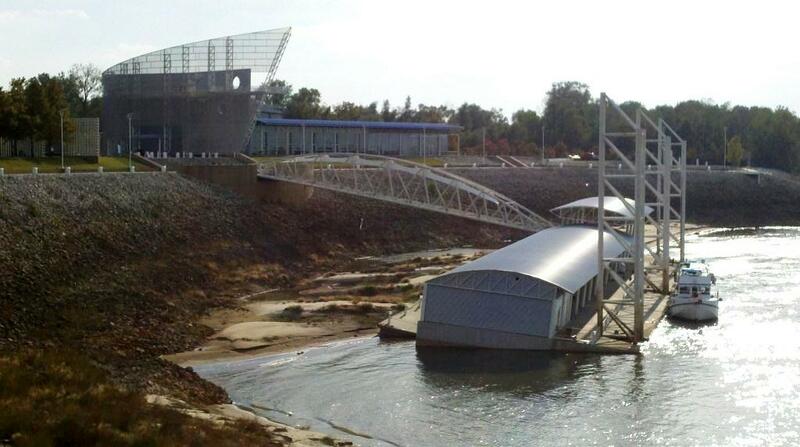 Then we found out the portion of the river we were on would be closed all day Saturday for some power boat races. Between the dropping water, the closure and Enterprise's limited weekend hours, we decided to return the car on Friday and leave early Saturday, before the closure. So, we skipped Graceland and turned the car in - complete with Joe's camera. He called about the camera almost immediately, but the car had been rented, then rented again on a one way rental and no one had found a camera in it. The good news is Joe doesn't just have one of anything. We spent the afternoon touring the Lower Mississippi River Walk which is on Mud Island. This is a scale model (about 31"= a mile) of the Lower Mississippi. They've got cities marked along the way and signs with interesting information about different spots. It was amazing to see how, even on the model, the river alternated between seemingly slow, quiet moving sections, to areas that almost looked like rapids. In real life we've found that in some places the water looks like it is boiling, with swirls and eddies. The swirling can be enough to bounce the boat around. It can be a bit intimidating, and down right scary in a small boat. We met a couple going south in a much smaller boat than ours who had done the trip in higher, faster water - which meant more severe eddies. They'd said they wouldn't make the trip again because of that, but here they were. We're constantly amazed and confused by the changing water levels and have had trouble finding pictures that really illustrate them. This one shows us docked at Mud Island Marina in Memphis. Near the top of the tall pole you can see some writing. It is marking the water level in May 2011. That was really high water, but the current level is also really low water. Somewhere in between is "normal." We left Memphis early enough to get out before the river closed, and docked at Tunica RiverPark, only about 38 miles down the river. Another illustration of water levels. They normally expect you to be able to dock on both sides of the barge here. We stayed here two nights - they were predicting thunderstorms for the second day, but we didn't really get much of a storm. It did give us time to go to another river museum - which was very well done. There was also a nice boardwalk through the wetlands - which were dry - and over a lake - which was also dry - as both are influenced by the river's water levels. Back on the river again, the scenery was pretty repetitive: trees, sand dunes, sandy beaches, more trees. But Joe enjoys the tows and their barges: trying to figure out what they're carrying, counting the number of barges. This one, however, really got our attention. Joe finally called, and the captain said they were some kind of reactors. The captain also said it had been a long night as his radar had quit working and his view was restricted by the large reactors. He had run all night! The next two nights we anchored on the river, well out of the channel. Joe didn't have much trouble finding places that he felt were safe from not only the passing tows, but also from any loose barges running down the river - which does happen, though not often. So, one evening this was the tranquil sight as the sun went down. When we got up the next morning it was still dark, but we could see lights flashing all around. Joe turned on the computer and saw lots of tows on our AIS display. As it got lighter, we could see that one tow had pushed its load to the bank just down river from us and others had evidently done the same nearby. On the radio as the tows negotiated passes, one captain was also thanking other's for their patience. We never knew what had happened, which may have been the good news. I've mentioned that there aren't many places to dock on the lower Mississippi. One place we really wanted to stop is Vicksburg, MS. Through the course of his inquiries, Joe was put in contact with Jimmy who used to run a tour boat, Sweet Olive. Jimmy generously allowed us to tie up against Sweet Olive in the Yazoo River, which put us right in downtown Vicksburg. Of course, we had to climb through one of Sweet Olive's windows to get to shore, but that's okay. It was a great location and we could see the town dock sitting up on dry land waiting for the water to come back up to it. Our first day in Vicksburg we walked up to the new Lower Mississippi River Museum. You might think we'd seen everything there was to see about the river by now, but each museum seems to bring up something new or show things in a new way. This one in particular had some neat interactive displays. We spent some time playing with a table full of artificial sand. You could dig a river with your hands, then turn the faucet on and watch the water change the shape of your river as it found its path of least resistance. They also had some computers with touch screens. You could choose to be a farmer, businessman or a gambler. Then it would go through a story with you repeatedly picking between two options as the story progressed. The stories took odd turns - often resulting in death. Somehow, though, we found it comical and could hardly tear ourselves away before trying out all the options. Another part of the museum is one of the first diesel tows - the Mississippi IV - which is on display. It is large and besides having been a working tow for the Army Corps of Engineers, it was the host vessel for the twice yearly river inspections made by the Mississippi River Commission. There was a whole floor of the boat that was only used during those two cruises a year. By the time we'd finished at the museum, it was late afternoon and we noticed some police activity toward the main part of town. They'd blocked off the main street and were getting ready for a home coming parade! Soon people lined the sidewalks and the parade started with marching bands, ROTC groups, floats, and cars with pretty girls doing that funny beauty queen wave. Two high schools and a college participated. Evidently they'll only close the street down once for home comings. Along the parade route, we ducked into the Coca Cola Museum. Why Vicksburg? Coke's from Atlanta, right? Turns out in 1894 a guy in Vicksburg decided he'd sell more if people didn't have to come to town to get it from the soda fountain. So he started bottling it - never been done before. The museum had the original bottling equipment, an old soda fountain and lots of coke memorabilia. We rented a car again (Enterprise has such great weekend rates this time of year) so we could go see the Vicksburg National Military Park. We bought the cd that narrates the 16 mile tour through the battlefield and then spent most of the day there. Probably what surprised us the most was the topography of the battlefield. There were hills and ravines - hardly any flat land at all - and the cannons aimed at the river were on very high ground. It was easy to see why the siege lasted 47 days. Had the Confederates had more supplies, it's hard to imagine the Union troops ever prevailing. We'd heard good things about Natchez, but thought we might have to pass it up because there is no dock there. After numerous phone calls, Joe located a company with a barge in Vidalia, LA, across the river from Natchez. Travis told us that as long as they weren't unloading rock from a barge we were welcome to tie up - for a fee - after we signed a waiver. So, with no rock barges scheduled to arrive, we spent two nights tied to the barge in Vidalia. The Enterprise guy from Natchez had trouble finding us, but we finally hooked up and got a car in time to go out for dinner. Oddly, one of the places my book mentions in Natchez is Fat Mama's Tamales. Turns out there's a long - slightly disputed - history of tamales in the area. There's even a "tamale trail" that goes all the way to Memphis. So, we had the special, which was okay, and heard at least one German tourist eating there. The next morning we went to Frogmore Plantation in Louisiana. It's an old, but still functioning, cotton plantation. They've preserved some slave quarters and one of the very early versions of a cotton gin. Our docent filled us in on life on the plantation pre and post war, as well as telling us a lot about cotton and the process of taking it from the field, to the gin and beyond. She also defended the use of slaves as having been necessary to the country's economy. The process certainly was labor intensive and interesting to see. Natchez claims to have more antebellum structures than anywhere else in the country. Who knows whether that's true, but they've got a bunch of them. In April and October they have what they call the Pilgrimage. During the Pilgrimage, more than two dozen homes are open for tours. We were too late for the October tours, but there are a few that have year round tours. In the short time we had, we made it through two. The first one we toured was Longwood. This is the largest octagonal house in the country, they say. Construction started in 1861, but when the war broke out the Yankee craftsmen working on it went back north. The family moved into the walk-out basement to live while they waited out the war, which they expected to take only a few months. Haller Nutt, who was having the house built, died in 1864. His widow and their eight children continued living in the lower level, no longer having the funds to complete the rest of the house. Family lived there until 1968. Andy, our docent, is the grandson of last resident. He added so much personal perspective to our tour which included the finished lower lever and the unfinished main floor. Although it was interesting to see the unfinished area, it was sad to think that the magnificent home that had been planned will never come to be. open end down river. The fish swim up river, into the trap and get caught at the end. It looked like a lot of work to pull the traps up and re-set them, but they got some really big fish. One that was a throw away wound up on Joe's plate! In some of the river museums we'd learned about different things the Army Corps does to try to maintain the river banks. Sometimes they line the bank with a mat made up of concrete squares. As we came down the river, there they were, putting the matting down along the bank. Looked like quite a process. We even passed by the Corps Tow Mississippi V which replaced the Mississippi IV we'd seen at the museum in Vicksburg. Now that's a big tow. As we continued down the river, the scenery was not particularly exciting, but the ship and barge traffic was picking up. When we reached Baton Rouge, the amount of traffic was amazing. From Baton Rouge to New Orleans seemed like one big shipyard all the way down. We've been through Norfolk, and New York Harbor, but this just went on for mile after mile - 50 miles! There was no place for us to stop in Baton Rouge, so we just continued on to New Orleans. We passed the city and entered the Industrial Canal, which connects to Lake Pontchartrain. It was getting late and Joe was worn out from dodging ships and barges. Near the beginning of the canal is a lock that has a small float before the lock doors. We were allowed to squeeze around to the back side of the float and tie up for the night. Every time a boat was going to lock through, horns honked and bells rang to signal traffic that a bridge was going to be lifted. Then during the locking we could hear the water rushing past the boat. We thought we'd never be able to sleep, but must have been really tired because we didn't notice the noise at all once in bed. The next day we moved through the lock and on to our destination - Pontchartrain Landing, a new marina on the Industrial Canal just off Lake Pontchartrain. For a small fee the marina provides shuttle service to and from the French Quarter a few times a day. We rode the shuttle down and were drawn to St. Louis Cathedral on Jackson Square. Then, thanks to sister-in-law Bev, who coached us from Pensacola, we had a great lunch - brunch? - at Stanley. 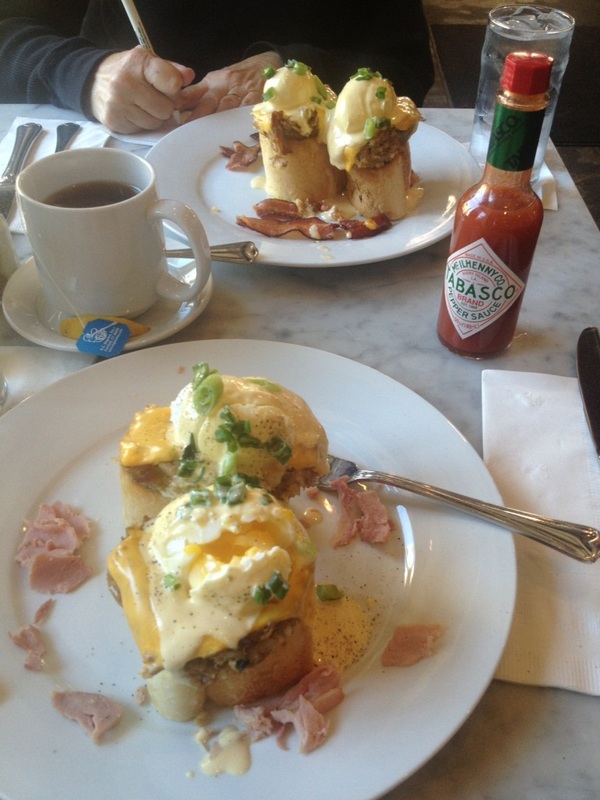 This was a NOLA take on eggs Benedict and was delicious. After lunch we decided to take a ride on the St. Charles Streetcar - part of which is actually a bus because of track work - through the Garden District and into Uptown. Fortunately, the live oaks that line the street survived Katrina as did the beautiful mansions. We were surprised to see so many Halloween decorations on the mansions. Then we had a quick forgettable dinner followed by cafe au lait and beignets at Cafe du Monde before catching the shuttle back to the marina. The next day we thought we'd stop in at the National WWII Museum for a few hours. Of course, we were there all day and didn't even make it to the Pacific - and the museum won't be complete for three more years! The visit starts with an introduction by Tom Hanks and a 4D movie - a quick overview of WWII. The museum itself combines battleground photos, short tapes of first hand recollections, and short films that tell the story of battle plans and outcomes along the way, along with the more typical written descriptions. A great museum. After the museum we had time for an early dinner before time to catch the shuttle back to the marina. 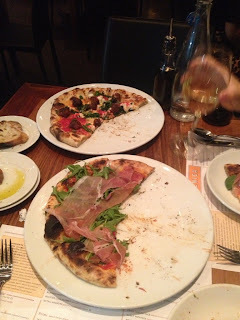 Bev had told us about happy hour at Domenica in the Roosevelt Hotel. Great restaurant, great happy hour - half price wine, beer and pizza. It doesn't really sound like we did very much, but we did a good bit of walking around also. We really enjoyed the visit and Joe no longer has such a bad opinion of New Orleans. Sometime we'll make it back and do more of the regular tourist stuff, but we decided we - and our bulging stomachs - were ready to move on to Pensacola. Joe always a fan of Tobasco found a bottle to his liking. Lots more pictures on picasa!